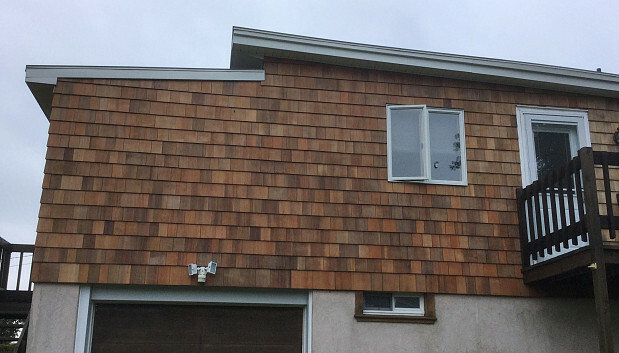 WHAT OUR NETWORX CONTRACTOR DID FOR US: Stained new cedar shingles, removed old shingles, and put up new ones. WHY WE CHOSE HIM: Local contractor with lots of experience. 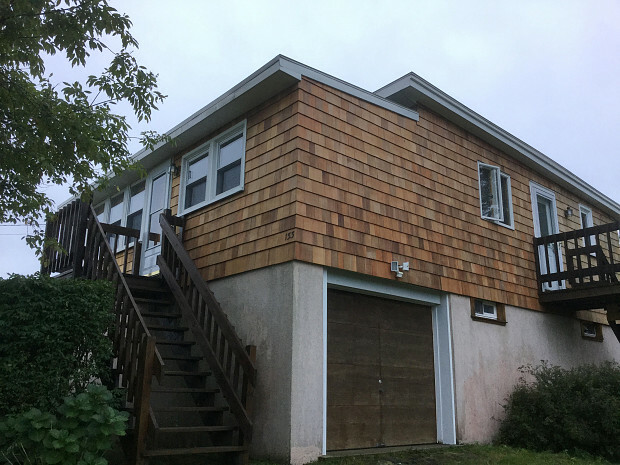 My wife and I live right down next to the water, only a couple of hundred yards from the ocean, in a cedar-shingled home. In the 31 years we’ve been in this location, with the salt to deteriorate the shingles, the rain to act as an oxidizer, and the sun to heat them up, it started to look like the side of the house was on fire. And the wood, over time, has reduced in thickness by more than 50 percent, so some of the shingles were just getting ready to break under the kind of wind like we have today. I also had severe woodpecker holes -- probably about 100 all told. To repair the shingles, I contacted a contractor referral service and got several phone calls in response. The fellow from RI Property Solutions LLC said he worked for Networx and had received my number from a friend and fellow contractor, who was a little bit too busy. He wasn’t far from my house and he sounded like he had plenty of experience, so I asked him to come and do the shingle repair work. He told me he’d be there at 5:00 the next day and sure enough, he showed up at 5:00. I had him stain the shingles before he put them up because I’ve got a 2-story structure here and don’t like the idea of people getting up on ladders and maybe falling off on my property. This method also saved time. We put cardboard down so he could lay out a box at a time and stain it. He did that a day or two in advance, so they were pretty much dry by the time he put them up. He stained the new shingles, removed the old siding, and installed the replacement shingles on my house. He wasn’t fast; some guys put up a bunch of shingles as quick as they can pick up the nail gun and fire it. That’s not the way this guy was. He checked everything out, made sure it was aligned right, gapped right and then he did it with an individual nail and a hammer, the old-fashioned way. His work was very good and he didn’t rush or try to push me to buy any type of product. As far as pricing went, he made a mistake in my favor. What happened was, he had looked at the box of new cedar shingles and thought it covered a whole square. But since the square was based on a much wider gap between shingles – 8 inch instead of 6 ½ inch – he had to go out and buy some more, which cost him extra time plus a few hundred dollars. I told him on the last day, “I think I owe you some extra money” and he said, “Yeah, I’m taking a beating on this.” I said, “No, you’re not.” I figured out how much to give him and he said, “Aww, thank you.” Legally, he had quoted me a price in contract form, but I wasn’t going to see him bite the dirt. He had done such a good job and was such a nice guy about it. He didn’t try rushing the work because he’d made a mistake, so I just couldn’t see making him chew up the loss. Besides having him back for other jobs since then, I took a bunch of his cards and passed them out to several neighbors and friends, in case they want to have somebody dependable to work around their house. He tries to oblige and really likes people. In fact, he took one day off to volunteer through his church, building a ramp for some people without charging them a thing. When you hire a contractor, look for somebody just like this individual, someone who’s honest and trustworthy, has plenty of energy, knows his business, and does a good job. I’ve been out here 42 years and I haven’t found a contractor this good, this honest, and this caring as I have with this guy. None that even come close. 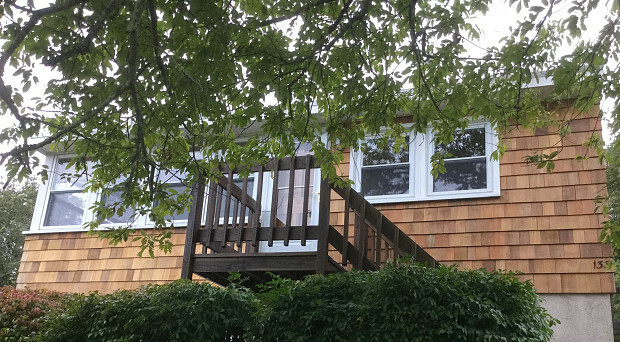 Emergency Roof Repair to Replace Broken Shingles by Liu P.
Hire A Meticulous, Highly Professional Plumber For Peace Of Mind by John M.
Desperate for New Air Conditioning on a Hot, Humid July Weekend by Alan E.